The ancient 864/275 method for pi is a major factor in the Great Pyramid’s full design and is also a factor in the formatting of the Pyramid geographic mile. The earth’s 7920 mile diameter x 864/275 = 24883.2 miles or 21600 Pyramid geographic miles, there are 21600 minutes in a circle so 1 Pyramid geographic mile = 1 minute of the earth’s circumference. Therefore it is significant that 1 Pyramid geographic mile x 1 megalithic mile = 864/275² miles which is the surface area of the 864/275 mile circumference sphere or in other words the 1 mile diameter sphere above. The rectangles below demonstrate the remarkable commensurate factors of the 1 mile diameter sphere. The 2 mile diameter circle below has an area of 864/275² miles therefore we could say that it represents the surface area of the 1 mile diameter sphere in circular 2 dimensional format and the outer rectangles above and below represent the same in rectangular format. 1, 2, 3 and 4 sides of the full design Great Pyramid’s base. The inch measurements i.e. 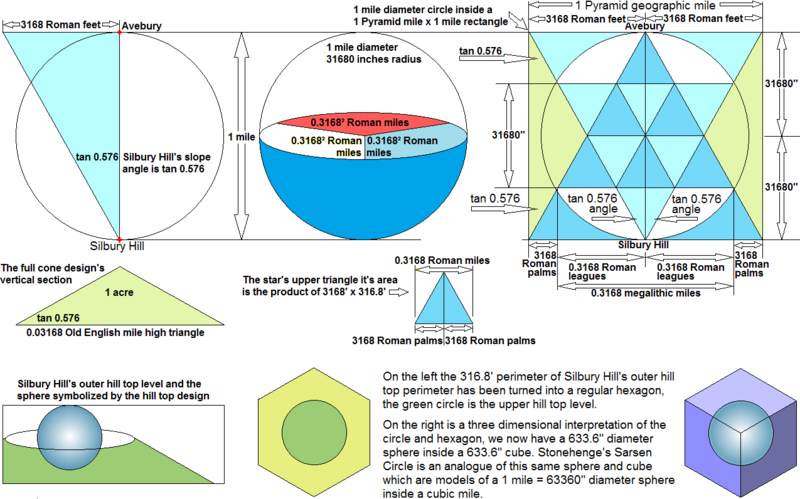 9123.84”, 18247.68” and 27371.52” are used by the designs of the monuments to represent the earth’s 9123.84 megalithic mile circumference = 18247.68 Roman leagues or 27371.52 Roman miles. This was the size of the earth’s equator before the bulge appeared and turning once a day = 18247.68” or 0.3168 Roman miles per second. The measurements below also emphasize that the Pyramid geographic mile is the product of 3168 Roman feet + 3168 Roman feet = 6336 Roman feet = 1 Pyramid geographic mile. Interesting because they are features of the 31680” radius sphere = 63360” diameter = 1 mile. 633.6” x 633.6” x 633.6” and multiplying the cube’s volume x 633.6 = 0.0006336³ miles which is the volume of the Great Pyramid’s full design. The Pyramid’s full design represents 6.336 million tons of solid limestone and has a 0.6336 Roman mile or 633.6 Roman pace base perimeter, he vertical section represents 1 quadrant of a 0.6336 Roman mile circumference circle. There are many more connections of this calibre in the designs of the monuments that demonstrate they had the same Designer. They say it is 1 mile from the centre of Silbury Hill to the centre of the Avebury monument so the monuments have been placed on opposite sides of a 1 mile diameter circle below, the star design inside the circle is based on the mile and the tan 0.576 slope angle of Silbury Hill notice that the tan 0.576 lines go from the centre of each monument to the corners of the 1 mile x 1 Pyramid geographic mile rectangle.